My kids love Peeps so we usually have them around Easter, and today I had some out for another project I’m working on. At the same time my kids happened to be begging for the open bag of chocolate chips in the pantry, AND I had a bag of lollipop sticks on the counter that were ready to be put away. What happened next is what I’m calling kismet. 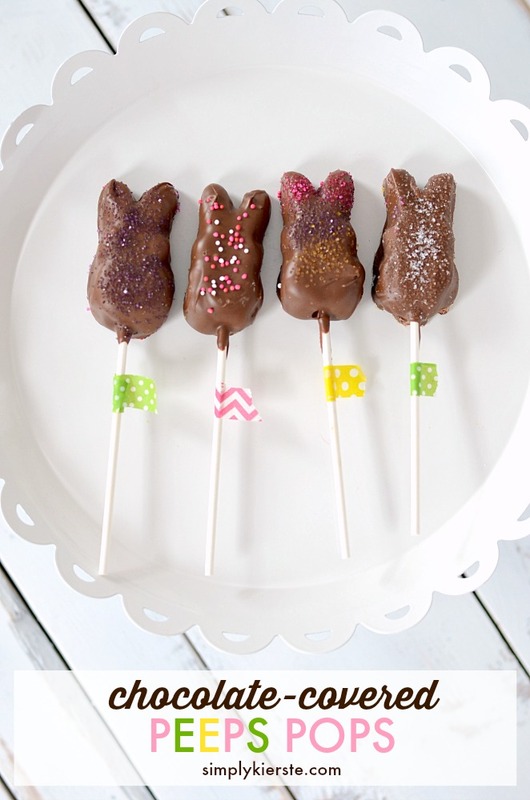 Chocolate-Covered Peeps Pops. My kids loved these so much, they were gone in about 30 seconds flat. I’m lucky I even got a picture of two for this post, because they were inhaled so quickly. I had chocolate-y mouths with huge smiles, and I was one of them! These adorable treats literally took less than 5 minutes for a dozen, and they were a breeze to cover in chocolate. I don’t know if it’s the sugar-coating or what, but the chocolate stuck really easily. I let my kids add sprinkles for the finishing touch, which they loved, and then…they were devoured! It’s really as easy as 1-2-3! Melt the chocolate chips in a microwaveable glass bowl–about 1 minute, stir, then 10 second intervals until you can stir it smooth. Insert a lollipop stick into the bottom of each Peep, and lay them on a large piece of wax paper on top of a cookie sheet. Carefully dip each Peep into the chocolate, using a spoon to make sure the entire surface is covered. Shake off the excess, and make sure it’s not glopped inside the ears. And no, I don’t think “glopped” is a word, but it sounds good! Set the peeps back on the wax paper, and immediately add the sprinkles. Once they’re all dipped and sprinkled, place the cookie sheet in the fridge or freezer until set. That’s it! SO easy, and SO fun! Melt the chocolate chips in a microwaveable glass bowl--about 1 minute, stir, then 10 second intervals until you can stir it smooth. Insert a lollipop stick into the bottom of each Peep, and lay them on a large piece of wax paper on top of a cookie sheet. Carefully dip each Peep into the chocolate, using a spoon to make sure the entire surface is covered. Shake off the excess, and make sure it's not glopped inside the ears. And no, I don't think "glopped" is a word, but it sounds good! Set the peeps back on the wax paper, and immediately add the sprinkles. Once they're all dipped and sprinkled, place the cookie sheet in the fridge or freezer until set. Melt the chocolate chips in a microwaveable glass bowl--about 1 minute, stir, then 10 second intervals until you can stir it smooth. 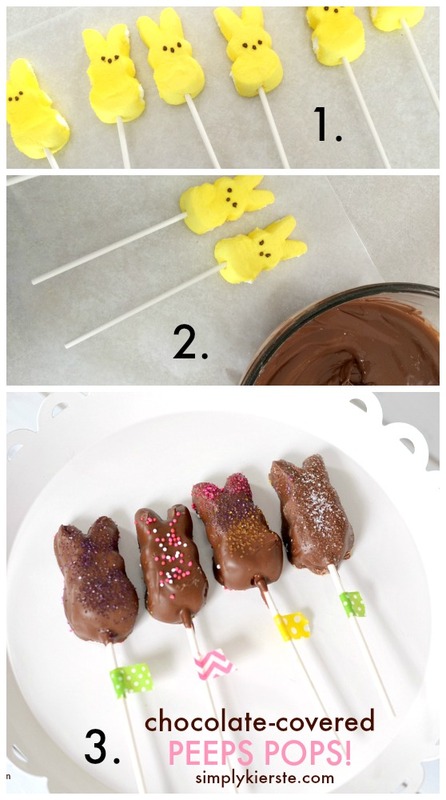 Insert a lollipop stick into the bottom of each Peep, and lay them on a large piece of wax paper on top of a cookie sheet. Carefully dip each Peep into the chocolate, using a spoon to make sure the entire surface is covered. Shake off the excess, and make sure it's not glopped inside the ears. And no, I don't think "glopped" is a word, but it sounds good! Set the peeps back on the wax paper, and immediately add the sprinkles. Once they're all dipped and sprinkled, place the cookie sheet in the fridge or freezer until set. These look so fun and tasty! I need to make them! I bet the sugar coating is the secret ingredient! Such a fun idea! I love how you added the washi tape to the sticks. So cute!